These are sort of like bite sized coffee cakes. They have that oh so tasty swirl of brown sugar and cinnamon. Yes, I am totally in love with my little mini cupcake pan. Adorable food is the way to go. You feel like you are totally indulging because you can have three instead of just one. These are awesome with a lovely foamy latte or special tea. These are just so cute! I think I might include these in a tea tray outside this summer. Anyone care to come over for afternoon tea? Combine the flour, splenda, baking powder in a bowl. In another bowl, mix the applesauce, egg whites, and milk. Add the flour mixture to the apple sauce mixture gradually. Stir until well mixed. Spoon 1 tsp of batter into each mini cup of your mini cupcake pan. In a ramekin combine the brown sugar and cinnamon. 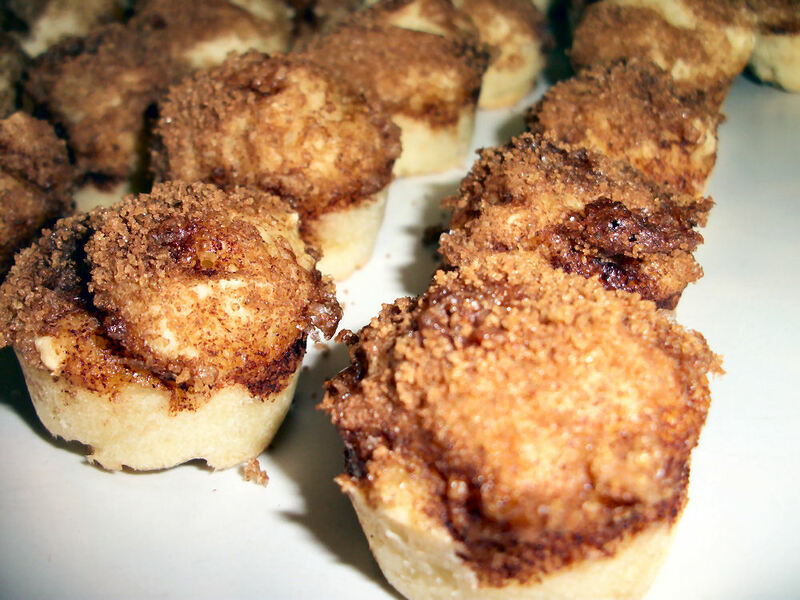 Top each mini bite with a half tsp of the cinnamon mixture. Using a toothpick swirl the mixture into the bite. Bake at 350F for 15 minutes or until golden. Makes 36 bites. Each bite contains 26 calories, .1 gram of fat, 6.4 grams of carbs, .2 gram of fibre, and .9 gram of protein. So go ahead, have a few! This entry was posted in Breakfast, Comfort Foods, Craving Buster, Dessert, Snack and tagged apple, Cinnamon, Milk. Bookmark the permalink.